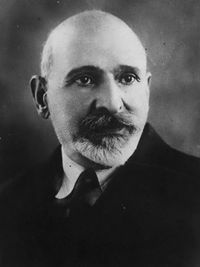 Historian and philologist Hakob Manandian was one of the most respected names in the field of Armenian Studies during the first half of the twentieth century. He was born in Akhaltskha (Javakhk, nowadays Georgia) on November 22, 1873. He had his elementary education in the Karapetian School of his birthplace (1880-1883). In 1883, after the death of his father, he moved to Tiflis, where he continued his education in the first gymnasium of the city. In 1893 twenty-years-old Manandian went to Germany to pursue higher education. He entered the School of Philosophy of the University of Jena, while following the courses of Oriental studies and linguistics at the universities of Leipzig and Strasbourg. He studied with the best scholars of the time, including well-known names in Armenian Studies like Heinrich Hübschmann and Heinrich Gelzer. In 1897 he defended his doctoral dissertation in philosophy about the identity of the author of History of Aghvank, the earliest source on the history of the region between Artsakh and the right bank of the river Kura. This dissertation was published in Leipzig in the same year (Beiträge zur albanischen Geschichte, 1897). Manandian moved to St. Petersburg in the fall of 1897 and finished his studies in one year at the School of Oriental Studies of the local university with a diploma of doctoral candidate in Armenian and Persian philology. After a year spent researching Armenian manuscripts in the libraries and museums of London, Paris, Vienna, and Venice, in 1899 he accepted an offer from the Gevorgian Seminary of Holy Etchmiadzin and started a thirty year career as an educator. He became a teacher of classical Greek and German, Greek literature, and history of philosophy until 1905. Meanwhile, he was one of the editors of the short-lived Armenological journal Zeitschrift für armenische Philologie (1901-1903). In 1905 Manandian settled in Tiflis, where he taught German, Armenian, Armenian literature, English literature, and other subjects in the Russian gymnasia (1905-1907) and the Nersesian School (1906-1907). In 1909 he graduated from the Law School of the University of Dorpat (Tartu, nowadays Estonia). In the 1910s he moved to Baku and taught at the Popular University (1911-1913) and the Commerce School (1915-1919). When Armenia declared its independence in 1918, Manandian was not only a seasoned teacher with two decades of experience, but also a well-reputed scholar. He was invited by the University of Yerevan in December 1919 (officially opened in Alexandropol) and became acting dean of the School of History, Linguistics, and Literature. After the establishment of the Soviet regime, he remained at the university. In the next ten years, he became rector (1921-1922), dean of the schools of Oriental Studies and History and Literature (1921-1924), head of the chair of Armenian history (1921-1925), and professor of the same chair (1925-1931). He left the university in 1931 to devote himself to scholarship. Among his more than 150 works in Armenian, Russian, and German, Manandian produced a string of Armenian books in the last twenty-five years of his life, which cemented his lasting contribution to Armenian Studies. The first one was his monograph The Philhellenic School and Its Periods of Development (Armenian, 1928), followed by The Trade and Cities of Armenia in Relation to Ancient World Trade (Russian, 1930, translated by Nina Garsoian into English, 1965), Weights and Measures in the Oldest Armenian Sources (Armenian, 1930), Feudalism in Ancient Armenia (Armenian, 1934), The Main Roads of Ancient Armenia (Armenia, 1936), and others. However, his main works in this regard were the seminal monograph Tigranes II and Rome (Armenian, 1940, translated by George Bounoutian into English, 2007), and his masterwork, the three-volume Critical Survey of the History of the Armenian People (Armenian, 1945, 1952, 1957). The latter was meant to be a comprehensive history of Armenia from the sixth century B.C. to the sixteenth century A.D., which nevertheless remained unfinished. Manandian’s scholarly and educational work was recognized in his lifetime. He became an emeritus scientific figure of Armenia in 1935, and received a second doctorate in history, without defense of a dissertation, in 1938. A year later, he was elected member of the Academy of Sciences of the Soviet Union and, in 1943, member of the newly founded Academy of Sciences of Armenia. His contribution was also recognized by the Soviet Armenian government with the order of the Red Banner of Labor. He passed away on February 4, 1952. A street in Yerevan was named after him in the 1990s.